Austrian researchers Nikolaus Hautsch, Christoph Scheuch and Stefan Voigt have just published their new paper “Limits to Arbitrage in Markets with Stochastic Settlement Latency”. Christoph and Stefan are affiliated with WU (Vienna University of Economics and Business) and the Vienna Graduate School of Finance. Together with Nikolaus Hautsch from the University of Vienna, they have been working on blockchain-related topics in finance since the beginning of 2017. We asked the research team that partners with Lykke Research Hub to introduce their work in our blog. How would you in short describe your research to a person who is not a specialist in your area? Christoph Scheuch: The major role of the blockchain technology is getting rid of the intermediaries that take important tasks in the settlement process in the financial system. In order to replace these intermediaries with a distributed ledger, we need a consensus protocol so that the distributed system can agree on the transaction history. But the consensus protocol is to some extent time-consuming, so is the settlement. For instance, all bitcoin exchanges are connected through the Bitcoin blockchain. If I want to transfer an asset between markets, I have to go through the blockchain and this takes time. The immediate implication for us as financial economists was: this is relevant for cross-markets trading! People are doing cross-markets trading all the time because they are looking for easily exploitable arbitrage opportunities. But since the transfer between those marketplaces is not immediate, there are risks for the arbitrageurs. In our paper, we provide a theory for that: equations and formulas to quantify this. We define what financial economists call limits to arbitrage: there are the boundaries beyond which arbitrageurs would not exploit the price difference they observe in the market, because they have to wait until the end of the settlement, and in this waiting time there can be adverse price movements. Stefan Voigt: Many market participants believe that the distributed ledger technology has the potential to radically transform the transfer of assets. We address the positive side of blockchain technology for financial markets but show that some of its benefits may be offset by implicit costs. Higher security and faster settlement at lower costs without any middlemen expose market participants with a random waiting time. We call this waiting time stochastic latency. Stochastic latency can make arbitrage trades very risky and rationalizes why we frequently observe persistent price differences for the same asset at different exchanges. It implies that markets may not be able to perform their ultimate desire — to quote “fair” prices, reflecting the true value of an asset — at all times. To decrease the threat of a double-spending attack, exchanges impose a high number of confirmations before they consider deposits validated. This has the adverse effect of making the limits to arbitrageurs even wider. In our paper, we use a novel and large hand-collected dataset and show that i) in the past there have been considerable price differences across crypto-exchanges, ii) most of the price differences do not represent arbitrage opportunities when adjusting for stochastic latency and iii) recently, price differences narrowed down, making it harder to spot arbitrage opportunities. Are you looking only at Bitcoin blockchain at the moment? Christoph: Empirically yes, but our theory applies to all existing distributed ledgers where no intermediary steps in to provide an immediate settlement. 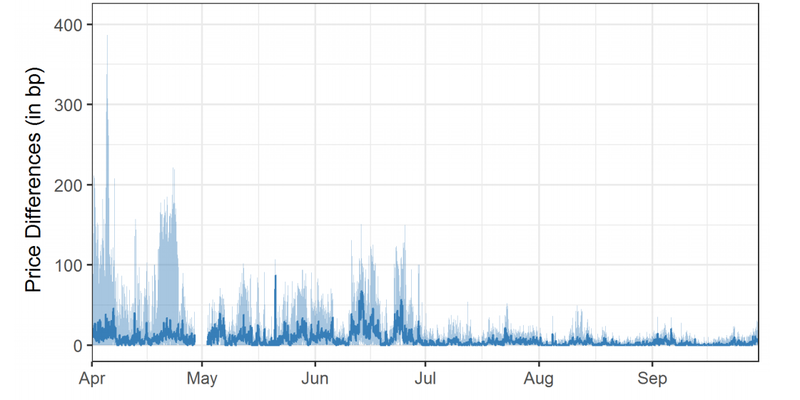 The good thing about Bitcoin from the research point of view is that it is fairly well-known by now and it is a very liquid market: we collect high-frequency data from 17 different exchanges which at least quote plenty of liquidity. Who would you recommend to read your research paper? Stefan: These are implications, first, for traders — both for crypto traders and those who approach crypto coming from traditional finance: they should better be aware of certain risks and costs. Today cryptomarkets are rather fragmented, which leaves investors with the choice to choose an appropriate exchange. In well-functioning markets, you could expect that the activity of arbitrageurs ensures that you get “fair” prices at every trading platform. Our research suggests, however, that the architecture of the underlying blockchain may reduce or even switch off arbitrageurs activity. The results can be seen as a caution not to trust the efficiency of the market but instead to properly choose trading venues. Based on our paper, you could get advice on how to build a trading framework, if you want to be active as an arbitrageur, and how this latency may affect your decisions. Our research can be useful for blockchain architects. The paper hints to a direct trade-off between the speed of transaction validation in a distributed system and the associated costs. Depending on the desired application, implied costs due to limits to arbitrage may more than offset potential benefits of migrating to a decentralized ledger. Vice versa, such considerations based on economic theory may help to construct consensus protocols which offer an optimal trade-off between latency, security, and costs imposed by the reduced activity of arbitrageurs. This may be of interest for exchanges: how may latency affect my business? Should I use a traditional framework with intermediaries and clearing houses or should we remove them? There might be a faster, cheaper and safer settlement, however at the cost of inactive arbitrageurs. We believe that they are a truly important part of financial markets, and in such a setting they won’t be able to work. Regulators might also find our paper useful. They are looking into blockchain at the moment considering whether it should be used to settle transactions. And we say: okay if you do that, this is the friction you generate — the settlement latency. And of course we are academics and we are writing for academics. There are still many open questions regarding the implications of adoption of blockchain technology for financial markets. In our paper “Limits to Arbitrage in Markets with Stochastic Settlement Latency” we provide the first step to understand the impact of settlement latency implied by distributed systems, which is a novel friction that might have far-reaching implications. Building the future of markets requires the future technology. Lykke Research Hub is here to make it happen.